Decorating pumpkins for Halloween has got to be the #1 activity the kids all love to do. This Cute and Easy DIY Pumpkins with Cricut project is perfect for family fun, classroom Halloween parties and group activities. It's great for all ages and is virtually mess free. Win all around, right? This quick Halloween Cricut craft is great for all kinds of decorating projects and the vinyl stickers are easy for even the kids to help with! Mix and match the pumpkin face pieces cut with your Cricut machine to make literally thousands of combinations. You can pre-cut all the face shapes and let the kids pick their favorites to make a cute pumpkin that is uniquely their own. This Halloween project includes a free SVG file you can use for all kinds of DIY and decor. Clean your pumpkin with a damp cloth and wipe dry. Download the SVG file. Upload it to Cricut Design Space. Ungroup and resize each pumpkin face to whatever size you need. Follow the onscreen instructions to cut out the pumpkin faces. Apply each face to each pumpkin. Finish off your pumpkin with ribbon or fabric strips wrapped and tied around the stem of each pumpkin. Tip: use outdoor or permanent adhesive vinyl to ensure it sticks to the pumpkin well. You can mix and match all aspects of your DIY pumpkins. For a fancier pumpkin, paint it or draw on it first and then add the vinyl face pieces. The sticker faces are prefer for all ages, even preschoolers and toddlers can have fun decorating a pumpkin without paint or carving tools. Use glitter vinyl for extra bling. I hope you have fun decorating your pumpkins! This SVG file includes 6 cute Halloween face cutouts. You can mix and match all the face pieces to make bunches of combinations. Just select the faces you want to use and then choose the “contour” option to hide the different pieces you don't want to use. This week I am sharing all kinds of fun Halloween crafts you can make with your Cricut. 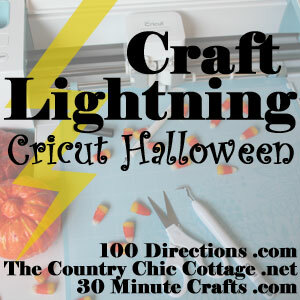 Check out today's Craft Lightning ideas. Check them all out and let me know what your favorites are! Trick or Treat Halloween Tote Bag from Pineapple Paper Co. Win a Cricut to make YOUR Halloween Amazing!